A contribution to the field of urban music studies, this book presents new interdisciplinary approaches to the study of music in urban social life. 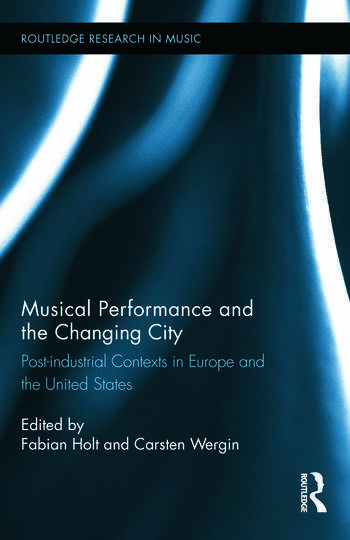 It takes musical performance as its key focus, exploring how and why different kinds of performance are evolving in contemporary cities in the interaction among social groups, commercial entrepreneurs, and institutions. From conventional concerts in rock clubs to new genres such as the flash mob, the forms and meanings of musical performance are deeply affected by urban social change and at the same time respond to the changing conditions. Music has taken on complex roles in the post-industrial city where culture and cultural consumption have an unprecedented power in defining publics, policies, and marketing strategies. Further, changes in real estate markets and the penetration of new media have challenged even fairly modern music cultures. At the same time, new music cultures have emerged, and music has become a driver for cultural events and festivals, channeling the dynamics of a society characterized by the social change, media intensity, and the neoliberal forces of post-industrial urban contexts. The volume brings together scholars from a broad range of disciplines to build a shared understanding of post-industrial contexts in Europe and the United States. Most directly grounded in contemporary developments in music studies and urban studies, its broad interdisciplinary range serves to strengthen the relevance of urban music studies to fields such as anthropology, sociology, urban geography, and beyond. Offering in-depth studies of changing music culture in concert venues, cultural events, and neighborhoods, contributors visit diverse locations such as Barcelona, Berlin, London, New York, and Austin. Carsten Wergin is Senior Researcher at the Institute of Social and Cultural Anthropology, Martin-Luther-University Halle-Wittenberg, Germany.